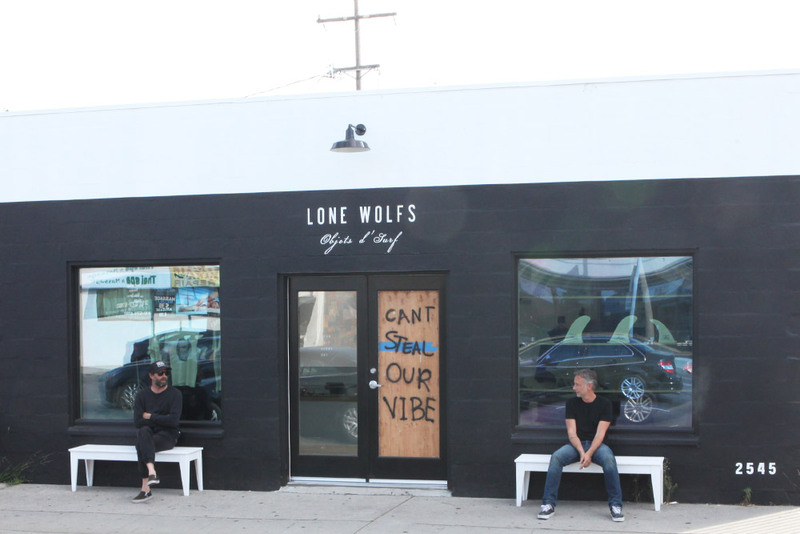 Lone Wolfs, Objets d’Surf, is a small surf store with a huge opinion. It’s a store that is color blind, void of much of the spectrum you and I appreciate in our daily views. It is stark, contrasting optic white with black in many various iterations. 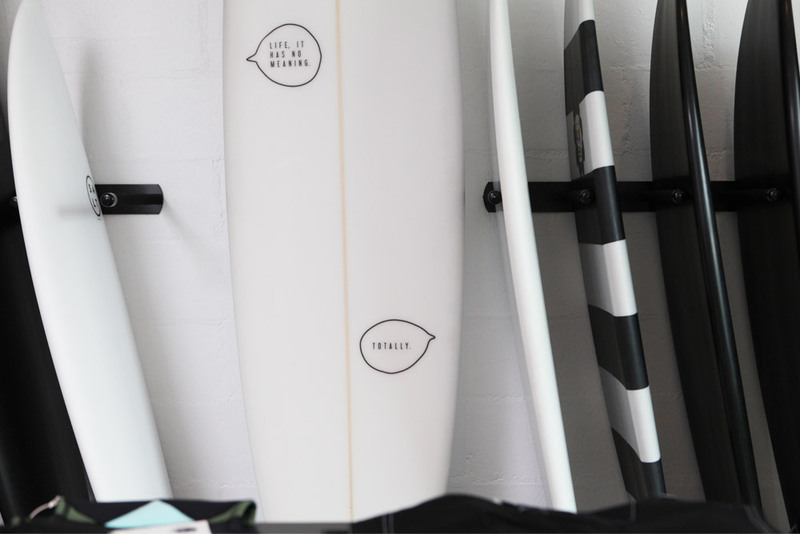 Its message is unique, defining a space that is mainly unexplored by surf companies, and the power of black and white makes the product that much more interesting. On a busy intersection of Venice Beach, the one you have to go through when going anywhere south, the store’s exterior is clean, sharp fonts and clean windows. Grey and white, with one plywood wooden door that is obviously a repair from someone throwing something through it. Before it opened, about 11 months ago, I was on Venice beach with my son doing a surf check of the pier, and we noticed a small crew with an opinionated longboard doing a little filming. Mostly bearded dudes, seeming strangely out of place and yet familiar, they had a humor about their task that was intriguing. The board was simply white, sprayed with a black cursive “ceci n’est pas un surfbord”, a french term ripped off and abused from the famous Belgian surrealist René Magritte. His famous piece “the Treachery of Images” was a painting of a pipe, with the term “ceci n’est pas un pipe.” beautifully scripted on to the work. The meaning of his work was that whilst the picture depicted a pipe, it was not an actual pipe. Funny that these guys had known the term (not everyone knows the reference), and given it their own absurdist remaking. Social media travels fast. I quickly found out it was a couple of guys about to open a surf store on Lincoln Blvd, here in Venice. Then I saw pics of guitars involved in the space as well as the surf shop, and the intrigue remained.